Hell comes to Earth in a middling start to Marvel’s mystical mini-event, Doctor Strange: Damnation. Doctor Strange: Damnation #1 somehow already feels dated through its direct connection to last year’s Marvel event, "Secret Empire". The series is written by Secret Empire writer Nick Spencer and current Doctor Strange writer Donny Cates, featuring art from Rod Reis. The series returns to the ruins of Las Vegas, a city destroyed during Hydra Captain America’s tyrannical reign over America. While the Avengers are ready and willing to put in some hard work to help the people of Las Vegas rebuild their city, Doctor Strange has another plan. Strange is still flush with power from his trip to Asgard and battle with Loki in the main Doctor Strange series, and he expends that power on a mystical shortcut to restore Las Vegas to its former glory nearly instantly. Unfortunately for everyone involved, there’s a certain ruler of a hell dimension that Strange has some history with, Mephisto, who’d like to argue over ownership of the city of sin. While the issue borrows plot points covered in Donny Cates’ Doctor Strange series, it reads much more like a Nick Spencer comic. That’s not just because it feels like a direct follow-up to Secret Empire, but it also feels more reined in than Cates’ normal style. The issue is heavy on dialogue as well, and it includes a lot of the ironic and referential humor that characterized much of Spencer’s previous work. Unfortunately, for all of the words on the page, the issue doesn’t cover much ground. Strange arrives on the scene and gracelessly pushes the story's start button. From there, the first issue of Damnation falls into the all-too-common trap of highly publicized event series: taking an entire issue just to get to the point promised by the solicitation text. This would be less of a problem if the execution were more engaging, but what we get is very brief moments of the heroes being their worst selves. Rod Reis at least has a style that fits the story well. His art has an ethereal and painterly look that feels like you’ve been sucked into a classical depiction of the underworld become animate. Besides a couple of dramatic splash pages that are executed superbly and a brilliant sequence of Strange in the act of resurrecting Las Vegas, Reis isn’t given much to do here besides depicting talking heads -- and even Mephisto’s smirking face is only interesting to look at for so long. The amount of dialogue needed to set up the series’ premise, which essentially is all this issue accomplishes, means that Reis is packing a lot of panels onto single pages, making for a claustrophobic read. 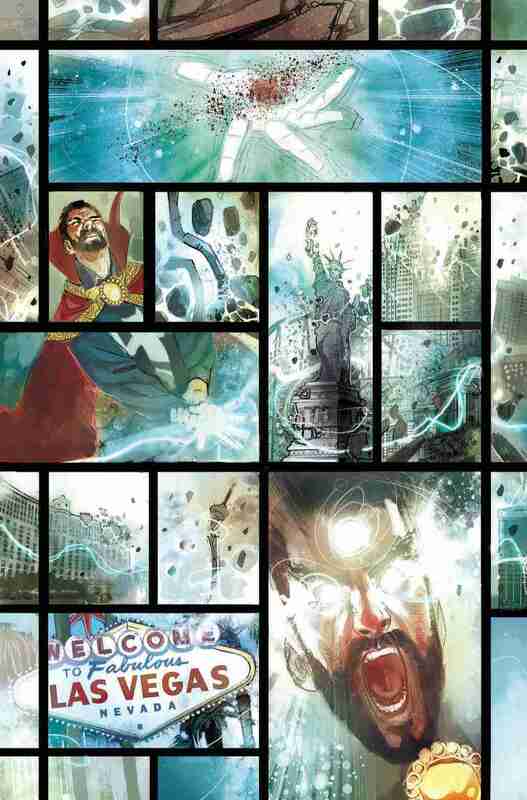 Doctor Strange: Damnation #1 is primarily concerned with setting up the series’ plot, but there are hints at some of the themes it may engage with. For example, heroes reaping what they sowed with petty infighting seems to carry over from Secret Empire, and Las Vegas may be where they pay their penance. Doctor Strange’s usual tragic flaw, his arrogance, is also front and center, though it's unclear so far what new Damnation has to say about it. The issue’s end, which we won’t spoil here despite already being advertised in the lead up to this issue’s release, suggests more interesting things to come, or at least the potential for more interesting things, but by the time readers get there they may be too tired to appreciate how excited the issue wants them to be about it. Doctor Strange: Damnation may turn into a worthwhile story, but the first issue feels more like homework than entertainment.